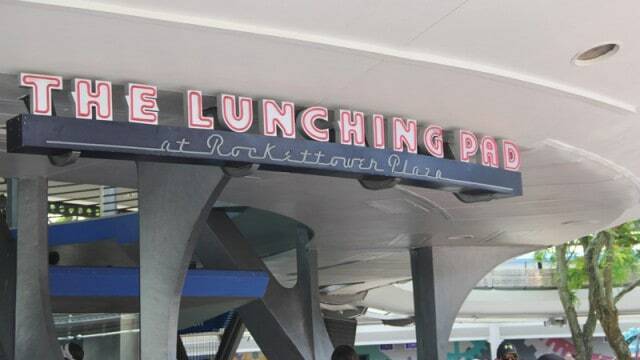 Rocket Tower Plaza s the central location of Tomorrowland in the Magic Kingdom and is topped with the Astro Orbiter and the Tomorrowland Transit Authority PeopleMover with a quick service dining location on the bottom. The Lunching Pad is a clever play on words that features several ordering counters and an array of specialty items that guests are sure to love. Some menu options at The Lunching Pad include the Barbecue Pulled Pork Sandwich, All-Beef Hot Dog, Pepper Jack Warm Stuffed Pretzel, Infinity Pretzel, and Churro.